A control valve is simply a variable orifice that is used to regulate the flow of a process fluid according to the requirement of the process. They can throttle flow over a range of fully open to fully closed. The control valve is normally used with an electric,pneumatic or hydraulic actuator for automatic or remote control . Valve Body – The part of the valve that connects to the process piping and carries the fluid flow is referred to as valve body.Valve bodies must be able to withstand the same pressure and temperatures as the process piping. Bonnet – Bonnet is a metal covering that is threaded or bolted to valve body.It allows you to install,inspect and replace the parts of the valve within the valve body.It allows you to mount the actuator yoke on the valve. Trim – The term trim refers to all of the valves’s internal metal parts that come in contact with process fluid. 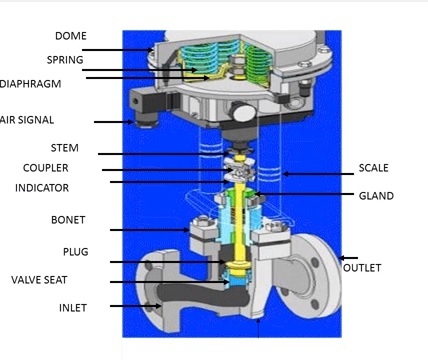 Valve Stem,Seat,Plug,Cage etc..
Plug – A device that controls the fluid flow,made of Teflon or similar material and connected to valve stem. Cage – A fixed cylindrical device that works with the plug to vary flow. Seat Ring – A ring that mates the plug to the surface. The process fluid (Liquid or Gas) enters the valve body and is controlled by the position of the valve stem,valve seat, and the valve plug assembly.